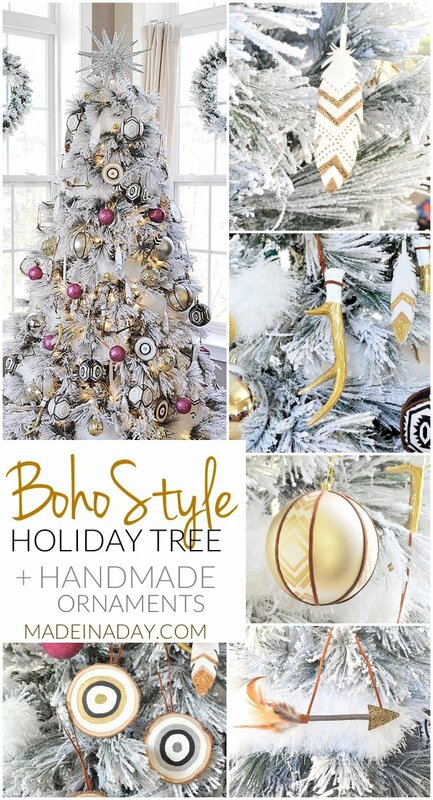 Looking for custom patterned ornaments? 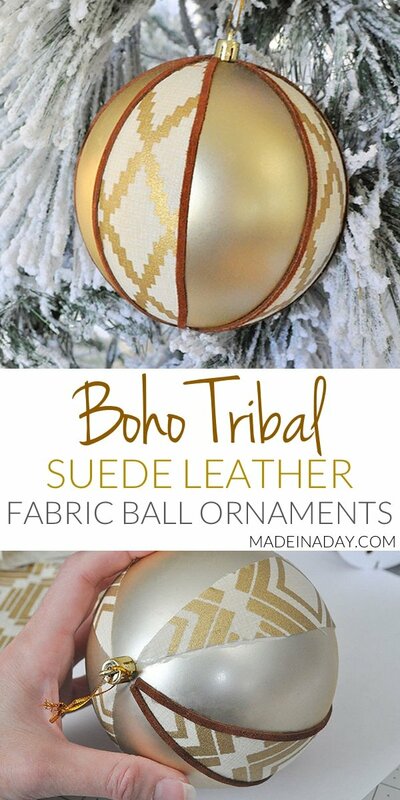 Well, look no further than the Boho Fabric Suede Tribal Ball Ornament. 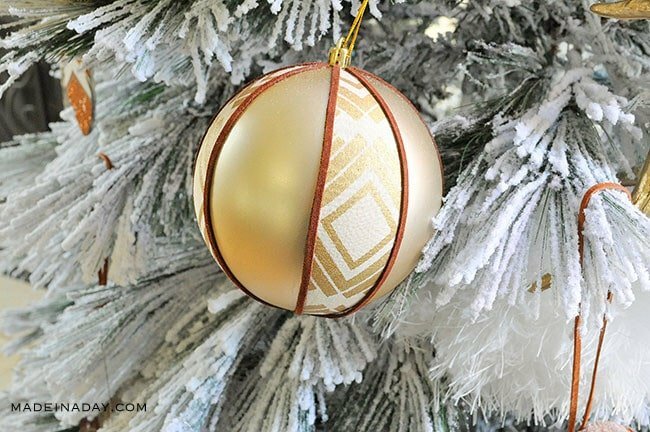 Simple fabric covered ornaments with endless color possibilities! For more fun holiday ideas see my Christmas page. This year I was looking around for some new ornaments. I am giving my Christmas tree a bohemian vibe to the match my home decor. I was unable to find just what I wanted that felt bohemian. So I decided to make my own ornaments to blend with the global style I have incorporated into my home. 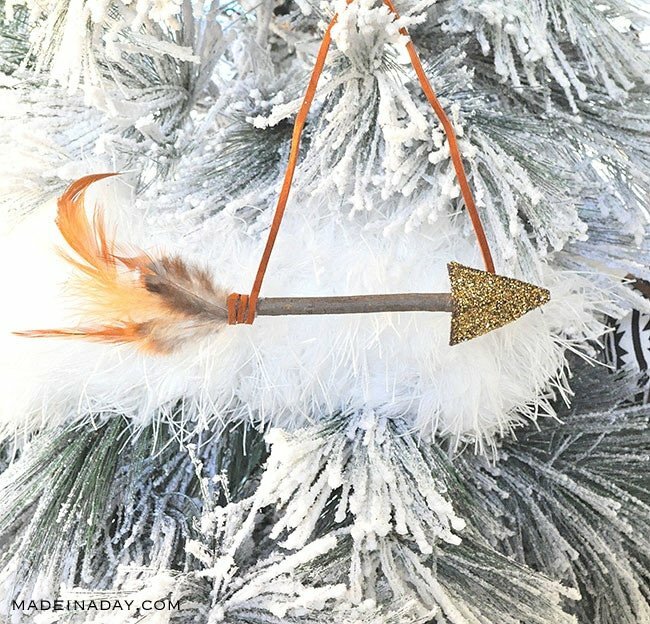 In my previous posts, I made some fun glitter and Feather Arrows and some fun Frosted Bullseyes for my tree. 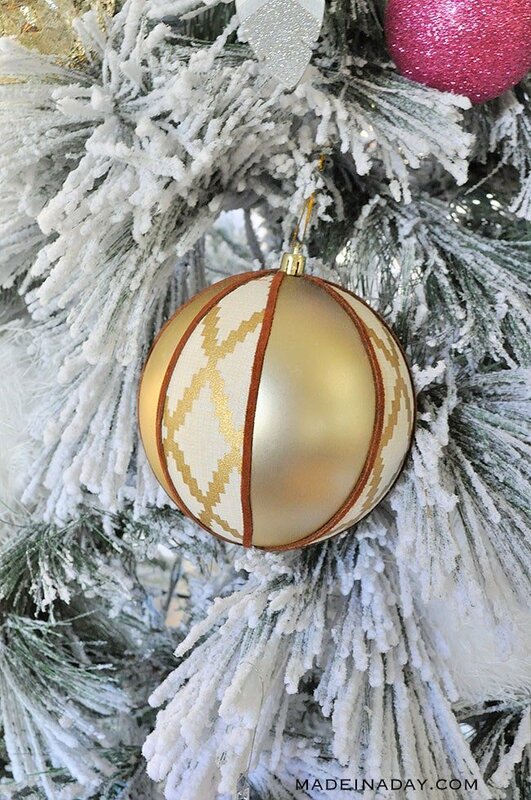 To go along with them I made some fabric wrapped ball ornaments similar to the tribal ones sold by Target this year! See Target’s version in the image below. 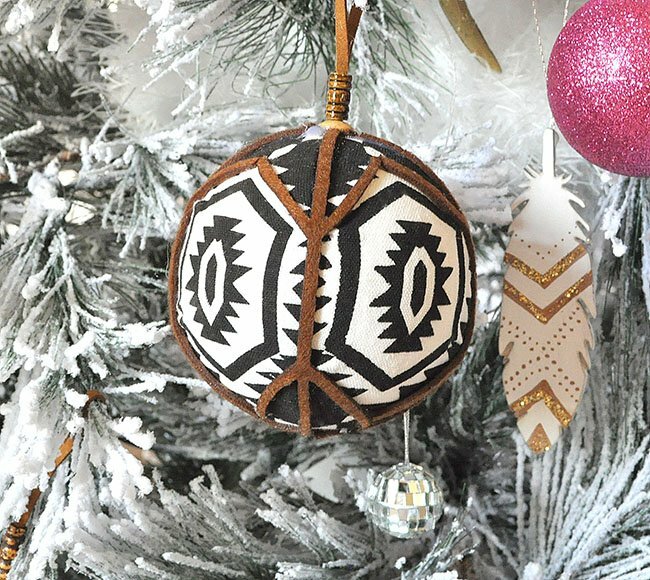 I actually bought some of the cloth tribal ornaments from Target to go on my tree, but I thought how fun would it be to have big tribal ornaments with a couple of different patterns. 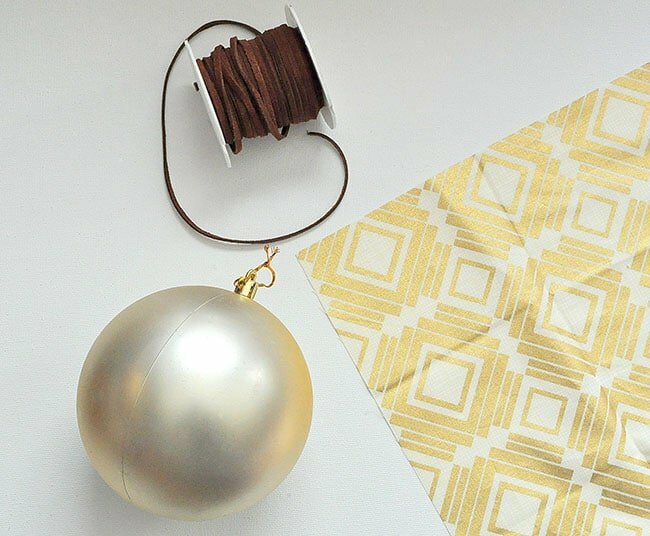 Making fabric ball ornaments are no easy feat. It is really tough to get the fabric to lay down smooth on a foam or plastic ball. After much trial and error to get just the right size ball to get the fabric to lay down smooth. I think I finally perfected it! The color and fabric possibilities are endless with these. Here’s how I made them! 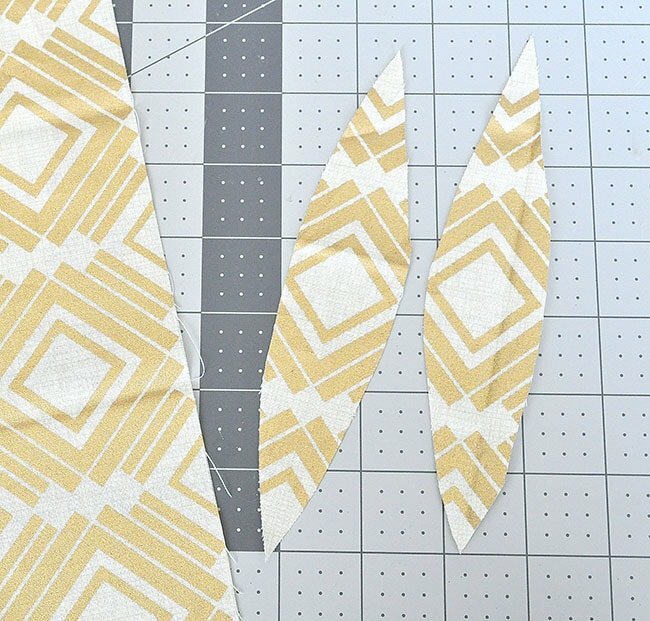 Cut a strip of fabric in a long thin diamond shape 7 inches long and 1.5 inches wide. Size of fabric will differ with the size of the ball. 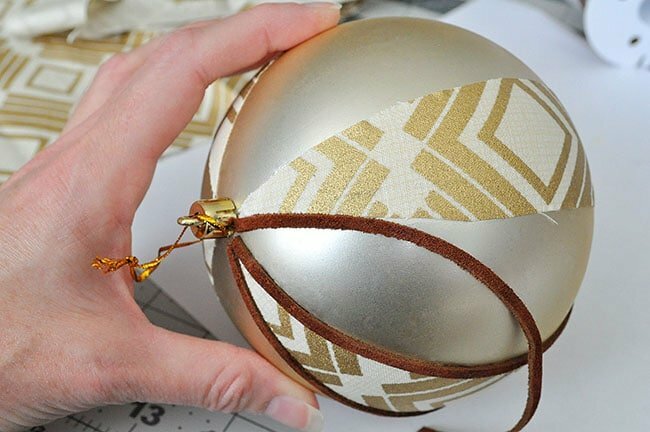 This was the best size to get the fabric to lay smoothly over this 5-inch ornament. Paint a layer of Elmer’s Glue-all over the back of the fabric. 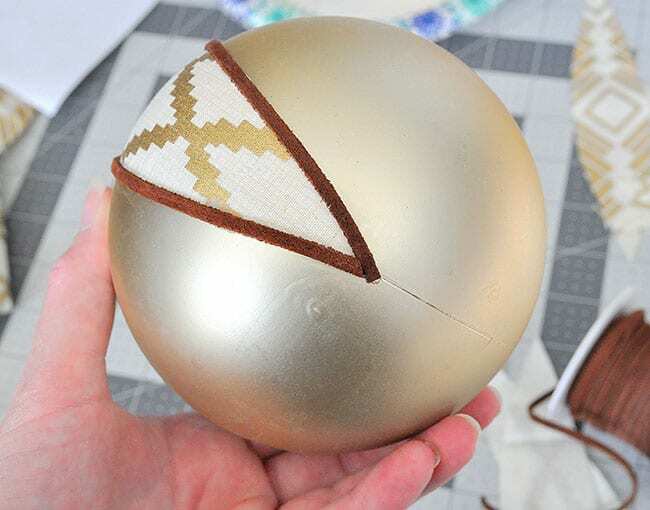 Lay the end of the fabric diamond on the top of the ball, center and smooth over ornament. Stretch the fabric a little so it will lay smooth. 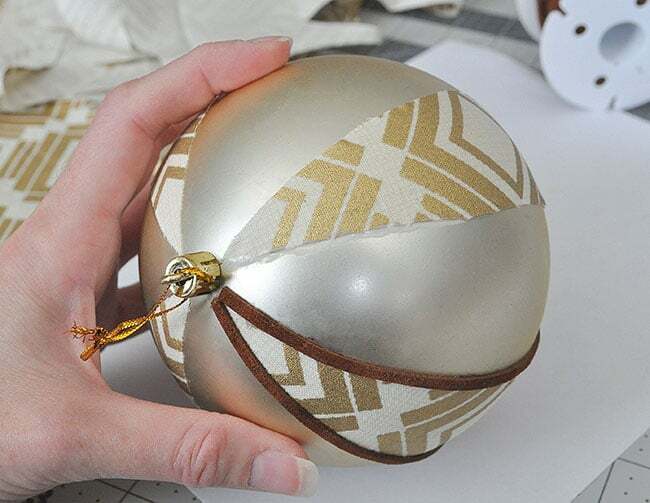 Use a wet wipe to remove any overflow of glue on the ornament. Measure your suede lace cording to match the size of the fabric strips (around 6 3/4 to 7 inches depending on the ornament size). Using the flat end of a paintbrush add glue to the edges of the brush and add a small strip of glue to the edge of the fabric. 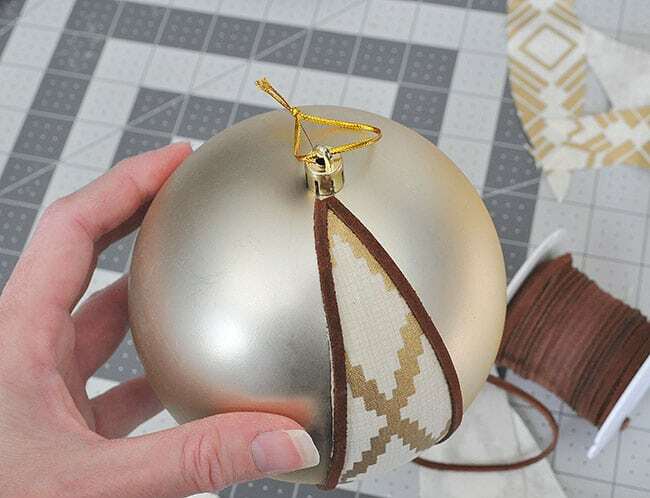 Lay the suede cording on the glue and work your way down the ornament. Repeat steps for another side of the fabric. Add four more fabric strips to the ball. 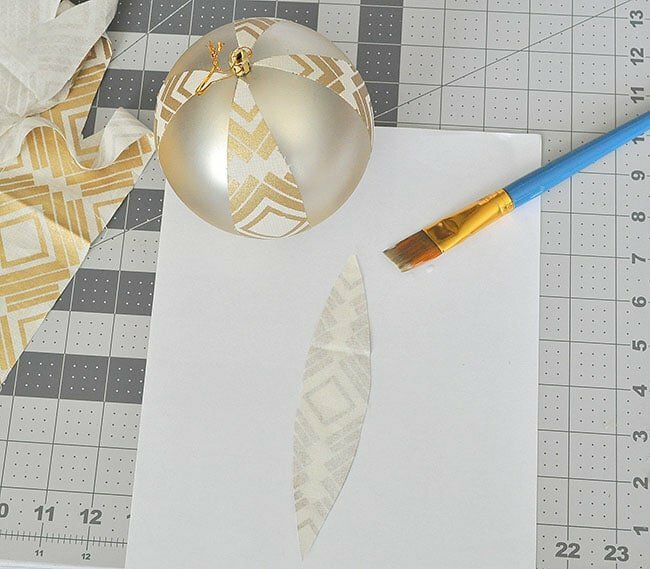 Clean up any glue on the ornament with the wet wipes. Let it dry overnight and that’s it! I can not believe how awesome these turned out! They remind me of the ones by Target but so much better because they are bigger! I may need to make these again with different fabric! 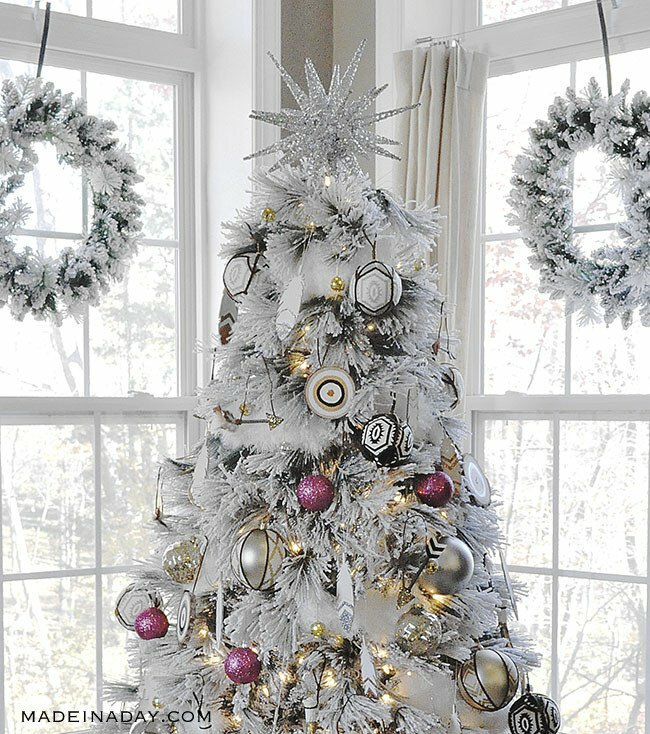 Your tree is absolutely gorgeous! 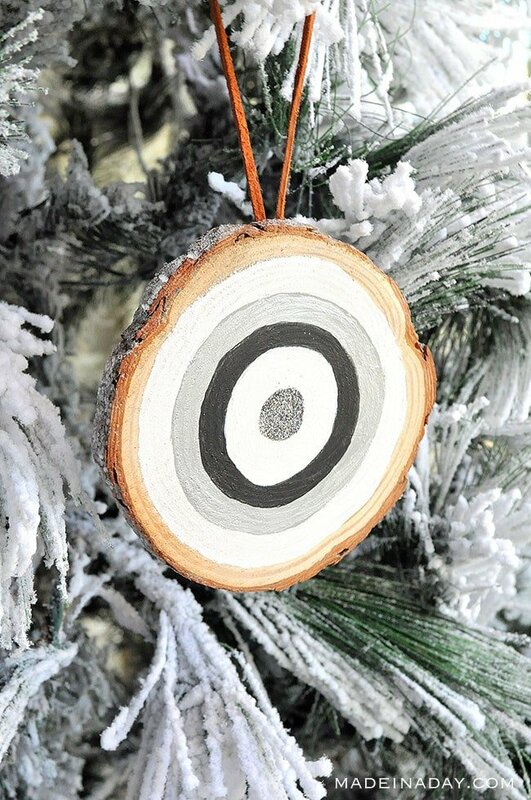 I love all the fantastic ornaments you made for your one of kind tree.